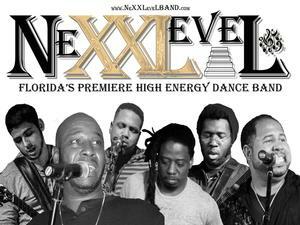 Nexxlevel is a high energy dance band that won't let your party skip a beat!!! Entertaining the SW Florida area for 2 years now, they have been a staple in the high end clubs of the area. There are few dance bands that can raise the level of your party and keep it there all night like NEXXLEVEL! No matter what your song tastes are, be it R & B, Funk, Classic Rock, Alternative Rock, Jazz, Top 40 or Hip Hop this band is sure to touch your "dance button"! For all your party needs Nexxlevel is the band for you!!! !......and remember.....Ain't no party like a Nexxlevel Party cause a Nexxlevel Party don't stop!!!!! !